Additional story contributions by Monique Jones. Kaya sat with her back to a corner, legs up on a chair, eyes on the door. Of course, she didn't want to look like she had her eyes on the door, in a place like this. So she kept her eyes on her tea and checked the door one sip at a time. It was good tea, dark and cold and thick with honey. Not the sort of thing you could buy in a place like this. The place was called the Wasp's Nest, and it was a certain sort of place, perfect for meeting up with unsavory characters. The man she was there to meet was respectable, a nobleman, which she supposed meant she was the unsavory one in the arrangement. Though you never could tell. Her fellow rogues came and went to the strains of an inexpertly played mandolin, and nobody let their eyes linger too long on anybody else's business. 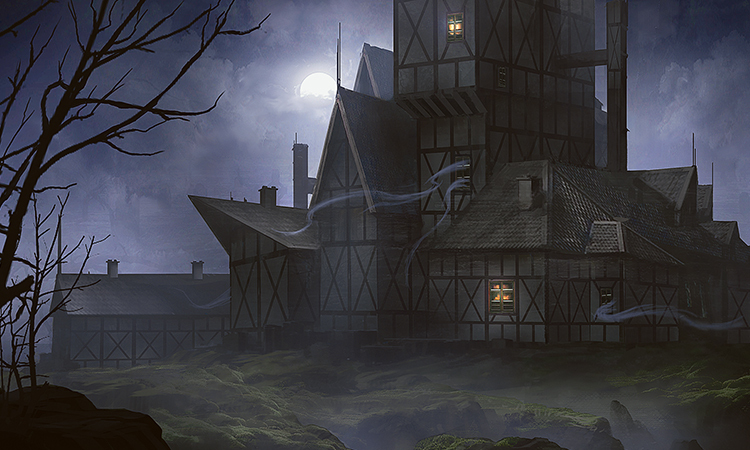 Tavern, saloon, watering hole, great hall—on a dozen worlds, these places were all the same. Kaya had tossed the barkeep a coin to cover the drinks she wasn't buying and another to leave her alone. Her prospective employer was only a few minutes late, but Kaya had been sitting and sipping for over an hour, getting a feel for the place. She was contemplating spending one more coin to buy the mandolin player's silence when her contact walked in. The man was wearing an iris in his brooch, the sign Kaya had been told to watch for, but she knew even before she saw that—beneath the shabby clothes, the man's bearing was crisp and military. Kaya inwardly rolled her eyes. Kaya herself had told them to look for her jacket, a distinctive style in the city. The place was warm, and Kaya had the jacket unbuttoned all the way to reveal a loose blouse beneath, but the man with the brooch caught her eye and walked straight toward her. So discreet! The soldier loomed over Kaya's table. Kaya didn't move except to wave one hand, inviting him to sit. Instead, the man leaned down over the table and said, "You're the hunter?" "As charged," said Kaya. "I'm going to guess you're not my client." "His grace will see you now," said the man, gesturing to the stairway. "Upstairs." Of course. His grace would never be seen in a place like this. Probably came in the back way. Kaya rose in one fluid motion, smiling. The man frowned and walked ahead of her to the stairs. Kaya buttoned her jacket as they walked up the stairs and down a short hallway. At the end of the hallway, the man knocked twice on a door much like the others, then opened it and gestured for Kaya to go in. The room was cramped, with a small desk set up in place of the bed. Behind the desk sat the man she had come here to see: Emilio Revari, third son of a noble house of middling influence. Behind him, standing at attention, were two well-dressed servants whose job had probably been hauling that stupid desk up here. Revari had greased hair and fine clothes. He sat like a young man, cocky and headstrong, but the lines on his face and the slackness of the skin around his jaw put him closer to 40 than 30. He smiled the bland, indulgent smile of nobility, only his dark, darting eyes betraying his nervousness. "Please, sit," he said, gesturing to a chair on the near side of the desk with a hand bristling with rings. One was a signet ring bearing his personal seal, and the rest looked jeweled and expensive. The man with the brooch closed the door and took up a bodyguard position beside the desk. Kaya sat, back to the door. Not her favorite thing. She leaned back in her chair. "Don Revari," she said with a properly deferential nod. "Indeed. And how shall I address you, Miss—?" In fact, Kaya came from a noble line herself, though she and her kin had never stood on ceremony. Since leaving her home plane, she saw no reason to mention her lineage at all. She knew. That was what mattered. "So," she said, before he could speak again. "What makes you think I can help you?" Some prospective employers misunderstood her work—tried to hire her for theft, or espionage, or mundane assassination. She had no qualms about walking out on them, nor about cutting right to the part of the conversation where she could decide whether to do so. "Some time ago," he said, "upon the death of my dear mother, I inherited her holdings here in town. My brother, the duke, had granted her a manor here to live out her dotage in peace and quiet. That manor now belongs to me. I waited for a seemly interval of mourning, sent workers to renovate the house, and prepared to take up residence." The Revari estate was back in Paliano. As the duke's younger brother, Emilio was free to stay there. But this manor out in the hinterlands, a house big enough to quarter dozens of soldiers or a couple good-sized families, would be far more comfortable for one coddled nobleman and his retinue. "I've heard your remodeling is taking longer than planned," said Kaya. She kept her ear to the ground wherever she went, and the rumors swirling around town had plenty of theories about the reason for the delays to the renovations. Don Revari had run out of money. He kept changing his mind about the decor. His mistress kept changing her mind about the decor. The house was haunted. The house was cursed. A scam-artist fortune teller had told him the house was cursed, but really...and on and on. Given that he was looking to hire her, Kaya had a pretty good guess which one of those rumors was true. "Considerably," said Revari. "It was little things, at first. Tools gone missing, repairs being undone. I chalked it up to laziness and peasant superstitions. But it got worse and worse, and there is no doubt in my mind: the place is haunted. Now the workers won't go in there even in the daytime for fear of the ghost, and people are starting to talk." A specter from beyond the veil of death had a grudge against him, and he was concerned for his reputation. "And this is...just some ghost," said Kaya. "...who happened to move in right after your mother's death?" "The spirit's identity," he sniffed, "is no business of yours. The point is, there's a ghost in my house, and I want it gone. I was told that's what you do." Spoiled little lordling. Kaya's mother had certainly never let her speak to people that way, lineage or no. "It is what I do," she said. "But I'm not just some exterminator, Don Revari, and ghosts are not vermin. I need to know the facts of the case so I can guess what this ghost of yours might do." "I have reason to suspect," he said, "that my mother...has refused to depart the premises." "Huh," said Kaya. "Any idea why?" "She's been clinging to this house for decades," spat Revari. "Could've passed it to me at any time, and I'd have seen that she was cared for. But no. The house was hers, and she wouldn't relinquish it. So I waited, patiently. Now she's dead, and I have mourned, and it is my turn. I want my house." "I'm sympathetic to your cause, Don Revari," she said. "I'll take the job." "Oh, good," he said bitingly. Kaya ignored that. Perhaps his grace was not accustomed to having the worth of his requests evaluated. In fact, she'd taken an immediate dislike to the man. But Kaya would happily take an unpleasant nobleman's money for ridding the world of one more soul who couldn't be bothered to finish their business when they had the chance. "Did you bring the building plans?" One of the servants stepped forward with a cylindrical wooden case, but Revari held up a hand. "I did," he said. "The originals and the renovations. But I keep asking myself...why you need them. They seem more suited to thievery than ghost hunting." "You calling me a thief?" "Well—I mean, really, what else are they good for?" "If you don't trust me, don't let me into your house," she said. "I can always find another client. And you can either find someone else with my very unusual skill set or live with your dear mother's ghost forever." "There's no need for that," said Revari stiffly. "I meant nothing by it." "Oh, good," said Kaya. She took the wooden cylinder from the servant's hand and tucked it under one arm. "Has the spirit been favoring any particular part of the house? Your mother's chambers, perhaps, or the room where she died?" "She's been seen all over the house," said Revari. He paused a moment, seeming to consider, then said: "From what I've heard, however...east wing. Second floor. Not her chambers. Could be where she died, I suppose." "And have you seen this ghost yourself?" "No," said Revari. "Since receiving reliable reports of the haunting, I've not set foot in the house, for obvious reasons." "I'm the interloper, aren't I?" said Revari. "If the old harridan is clinging to her property, I'm sure she'd have it out for me in particular." "Could be," said Kaya. "Anything else I ought to know?" "Not that I can think of," said Revari. "You'll do this tonight?" "Tomorrow night," said Kaya. She patted the case of building plans. "Proper preparation takes time." "Very well," said Revari. "Inform me as soon as the deed is done, regardless of the hour. I'll sleep far more soundly knowing that my mother is well and truly laid to rest." "As you like," said Kaya. "Then all that's left is the matter of payment. Half down, as I said in my letter." "Ah yes," said Revari, with obvious distaste. He withdrew a bag from beneath the table. Kaya took it without looking inside. It wasn't as if the man was in any position to cheat her. "I was wrong," he said. "At this price, you're not a thief. You're an extortionist." "Exorcist, your grace," said Kaya, smiling broadly. "It's pronounced exorcist." She took her money and the building plans, rose, bowed to the nobleman with an exaggerated flourish, and walked out. Kaya woke the next evening as the light from the setting sun peeked through the gap she'd left in the curtains. She'd spent the night in her little room at an inn, drinking cold tea and studying the house plans, then slept through the day. There was just no sense hunting ghosts in the daytime. Some of them wouldn't or couldn't come out, and others would but weren't substantial enough during the daylight hours to actually fight with. Kaya lit a candle, yawned, and splashed her face with water from a basin. She rolled out the building plans and studied them one last time, humming an old ballad and unwinding the knots she'd put her hair in to sleep. The plans had yielded no real surprises. It was a textbook High Troscan manor, with a few Anvar-era flourishes thrown in after the fact. All pretty standard for a house of this age in one of Paliano's less fashionable minor fiefdoms. The renovations were going to be the real challenge—Revari had provided both the original design and the plan the builders were working toward, but there was no indication how much work had actually been done before the workers had fled. She donned her jacket, checked that her two rondel daggers were well oiled, and securely sheathed them on her forearms. The candle had burned down by then. She blew it out, poured wax into a tray, shaped it into two little globs, and tucked them in a jacket pocket. She examined herself in the looking glass and saw a well-rested, fully prepared ghost hunter. Perhaps a bit cocky. Perhaps. Out the little door and down the stairs, then, to the common room of the inn where she was staying—a rather nicer one than the Wasp's Nest. The barkeep, a stout woman with a missing eye, gestured to her. "Mail for you," she said, handing over an unmarked envelope. "Hand delivered." Kaya raised an eyebrow. The list of people who even knew how to contact her here was not a long one. She opened the envelope and unfolded the single sheet within. It wasn't a letter, exactly; in fact, it bore no writing at all, just a symbol. The Black Rose. Her heartbeat quickened. So it was time—time for the big job, the one she'd been preparing for since last year. She knew where her next big payday was coming from, then...assuming she could actually pull it off. She thanked the barkeep with a copper coin and walked out the door with a spring in her step. She arrived at the manor as twilight gave way to full dark. One of Revari's pages unlocked the gate and the house doors for her, then fled the grounds as quickly as he could. The mahogany double doors swung open with a loud creak. She shut them behind her with heavy finality, then withdrew the wax plugs from her pockets and worked them into her ears. Call it a hunch. Kaya flicked her hand, and a trio of will-o'-the-wisps sprang from her fingers. They weren't true wisps, just lights, but they wandered around her as though they had minds of their own, sending cold light and deep shadows dancing silently around the entryway. Kaya walked through the entryway and into the receiving room. Her muffled footsteps echoed in the stillness. From the high ceiling hung a chandelier, which she opted not to walk directly beneath. One of the curving staircases was modern in style, brand new; the other had been torn out and not yet replaced. The whole place smelled of dust and age. She stepped over a hodgepodge of artisan's tools, shattered plates, and shredded paintings. So Dear Mother was one of those ghosts. Her voice echoed through empty hallways and was lapped up by lush carpets, fading back to silence. Cautiously, with her wisps bobbing behind her, she walked up the curving staircase step by creaking step. She paused on the balcony at the top of the stairs. To her right lay the western side of the house, given over to bedrooms, maids' quarters, and all the other amenities of noble life. To her left lay the east wing, which mirrored the west but was broken into a warren of guest bedrooms, sitting rooms, and libraries. She headed left with a purposeful stride, counting her steps. Whatever the phantom was protecting in the east wing, her best chance of finding the thing was to threaten that area directly. Beyond the balcony was a long hallway, with sitting rooms down one side and a large double door at the end. Behind the other wall, according to the plans, ran a long, cramped servants' passage. There'd been no construction here, and the carpeted floor was clear except for a shattered tea service dropped by some terrified butler. Kaya stepped around it. This time, a chill wind blew through the hallway, accompanied by a keening wail that seemed to come from everywhere at once. "Very spooky!" said Kaya. "Want to rattle some windows? Maybe throw some plates around?" Most spirits hated the living, and almost all of them hated being mocked. A spectral form appeared most of the way down the hallway, as though a curtain had blown open. 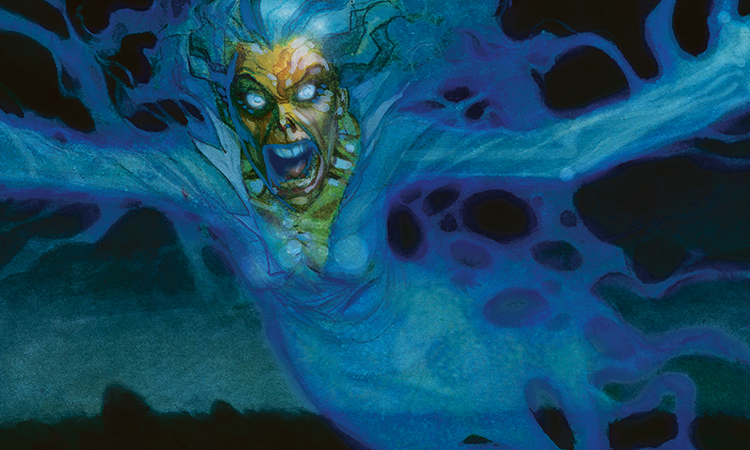 She looked like an old woman, glowing and translucent, her features distorted by death and rage. Her frail arms ended in slashing claws, and her shawl trailed off into something like a tail. Her sweet-old-lady face was split by a maw full of needle-sharp teeth. She hovered not by the double doors at the end of the hallway, but outside one of the doors along its length. Kaya took note of which one. "There you are!" said Kaya. The ghost screamed at her, a piercing shriek that slammed into her like a physical thing. Doors rattled, and somewhere a glass shattered. Kaya winced from it—but that was all, thanks to the wax in her ears. She drew her rondel daggers and pushed their blades beyond the physical, into the realm of the dead. They glowed purple-white and grew cold in her hands. "Yeah, no," she said. "Fun's over. Get out, and don't come back." The ghost screamed again and charged her. Oh well. That almost never worked, but Kaya felt like she had to give them the chance. The hallway wasn't wide enough to dodge the ghost's raking claws. Kaya imagined the blueprints, walking her fingers across them, counting steps. Left: library. No good. Too many loose objects a poltergeist-inclined spirit could send flying at her. To the right, then. Servants' passage. Tight squeeze. She waited until Dear Mother was almost within striking distance, then sprang to the right. This...was not the fun part. She started with her hand, already holding the dagger. The ghostly light and deathly chill spread up her arm, almost to the shoulder, as her hand, dagger and all, passed into the realm of the dead and through the wall. By the time her shoulder went through, her hand was in the servants' passage. She brought the hand back to physicality, let it anchor her to the realm of the living. The ghostly light consumed her head and body, bright and cold. She pulled her trailing arm and leg through and brought herself back to the world of the living, slamming into the far side of the cramped little passage with her now-corporeal shoulder. The whole motion took, perhaps, a heartbeat. Not that her heart actually beat, when she stepped out like that. She didn't dare stay long. She spun and dove back through the wall, back into the main hall, as the confused phantom flew past where she'd been a moment ago, trailing that shawl. She lit up one of her daggers and pinned the shawl to the wall. The ghost lurched to a stop, screaming, and turned to stare at her with dead white eyes. The ghost struck, but Kaya blocked with the other dagger, stabbing it through the ghost's gnarled palm. Dead eyes grew wide. That was the fun part—watching an undying, insubstantial phantom realize it had messed with someone who could fight back. Dear Mother twisted away from her, howling and snarling, tearing the shawl free of Kaya's dagger. Shawl and hand both leaked trails of glimmering smoke—ghost blood, more or less. Then the ghost was gone, spiraling up through the hallway ceiling. Kaya could do a lot of things a ghost could do, but she couldn't do that. She turned and ran toward the door where the ghost had first appeared. The bedroom had no floor. It was just an open pit lined with jutting timbers. Kaya glimpsed a half-finished spiral staircase before she went over the edge. That had not been in the plans. Secrets! Why did nobles always insist on keeping secrets? Kaya dropped one of her daggers—no time to sheath it—and spun, catching one of the timbers with her free right hand. The dagger landed down on the first floor with a clatter. She surveyed her situation as her wisp-lights caught up with her. Her feet were dangling maybe six feet above an uneven floor, her hand aching from taking all her weight at once. In front of her was some kind of crawlspace, maybe a foot and a half high, between the floors. She sheathed the dagger in her off hand. She could probably land without turning an ankle, but only probably—and even then, she'd be back down on the first floor. ...never rely on it. 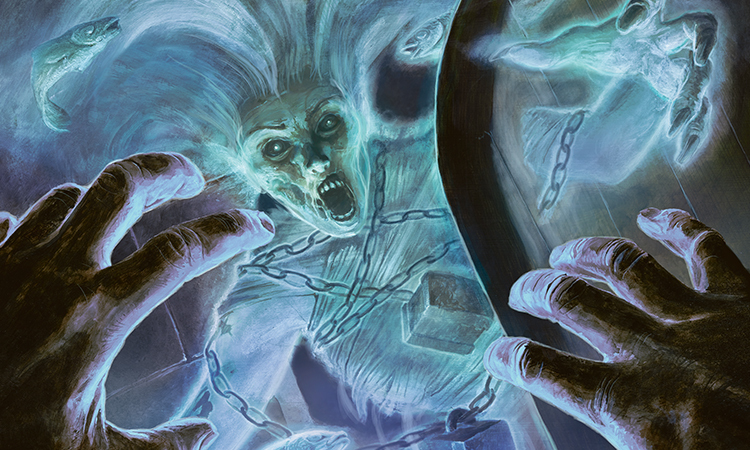 She let go of the timber, reached out into the chilly realm of the dead, and closed spectral hands around the spectral shawl. She'd caught the ghost by surprise, and it lurched downward a foot or two, snarling and spinning. Then it was up toward the third floor in dizzying flight, through what should have been a bedroom, screaming at the indignity. 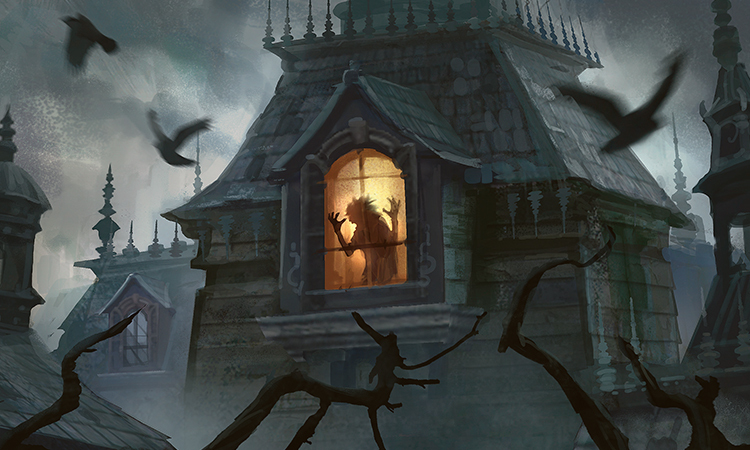 Kaya didn't want to hitch a ride for long—the ghost could drag her all sorts of nasty places. Straight up, for instance. 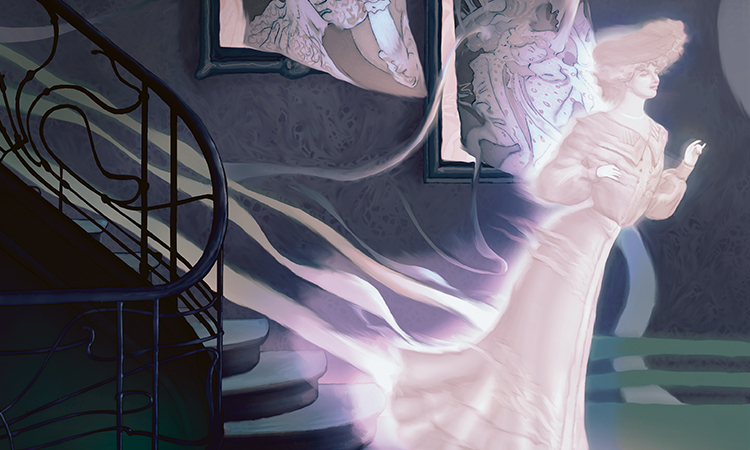 She judged the ghost's spin, timed her jump, and let go of the phantom's tail. She passed through a side wall of the bedroom-turned-deadfall, tucked, and rolled on the floor of the room beyond it. People tended to underestimate the amount of acrobatics involved in ghost hunting. She sprang to her feet and drew her remaining dagger. She'd lost count of her steps, but if she'd seen correctly, this was the room the ghost had appeared outside. Dear Mother flew shrieking through the wall just as Kaya put it all together. East wing. Not the mother's chambers. Crawl space. And now a strange little pile of detritus in one corner of an otherwise ordinary room the ghost seemed to care very much about. 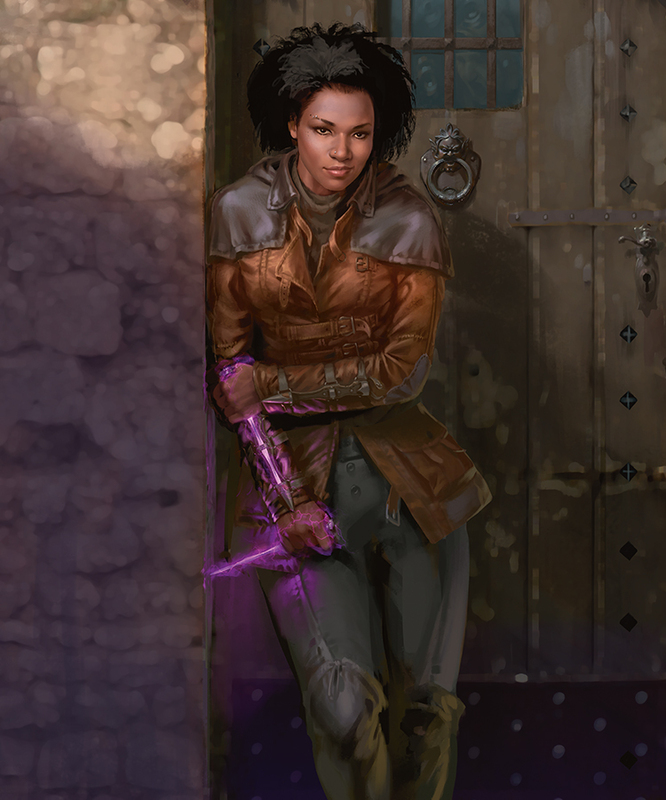 Kaya took a fighting stance with her dagger out in front of her, glowing with ghostlight. The spirit veered away this time, howling, now keenly aware that Kaya could hurt it. "Wait!" said Kaya, edging toward the corner. Dear Mother screamed again, and shards of glass and porcelain jittered on the floor. Kaya leapt toward the corner, glimpsing a ruined portrait, some jewelry, and floorboards with long, deep scratches in them. "I said wait!" yelled Kaya, holding out a hand. "I understand!" This time, the ghost paused. Keeping her eyes on the ghost, Kaya pushed aside the detritus, jammed her dagger between two of the ragged floorboards, and pried. She pulled up one board, then another. There, in the crawlspace, was the withered corpse of an old woman. The ghost wailed, and this time it sounded more like grief than anger. 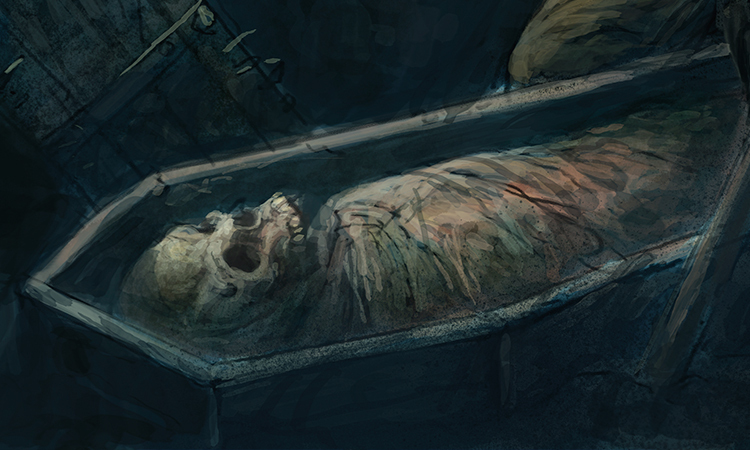 Kaya looked at the corpse, then back up at the ghost. The resemblance was striking. A signet ring. A familiar signet ring. Kaya waited in the fully lit entryway of Don Revari's modest but unhaunted townhouse, standing and resisting the urge to tap her foot. She ran her hands through her hair, picking out what she hoped was the last of the porcelain shards and tucking them in her pockets. Better her hair than her scalp, at any rate. It was nearly midnight, but she'd been ushered in. And despite the lateness of the hour, Revari himself appeared in the entryway, fully dressed and wearing a coat. "It's done?" he asked. Avarice gleamed in his eyes. "After tonight, Don Revari, your mother will rest in peace." "Take me there," he said. "I want to see the house." "Weren't we talking about trust?" said Kaya, with open indignation. "You've performed a valuable service," said Revari. "I can't be faulted for wishing to inspect your work before remitting payment." "Fine," said Kaya. "Bring the money, though. I'm not coming all the way back here." "As you wish," said Revari icily. It wasn't a long walk, but Revari opted to use a carriage, with a driver and a bodyguard riding in front and Kaya and himself inside. Revari asked a string of questions about her work, apparently out of no more than simple curiosity and the conviction shared by so many nobles that everything was their business if they wanted it to be. "Does it leave...remains? When you kill them?" "Every ghost is different," said Kaya, not for the first time. "In this case, yes, there's a physical residue." "Ah," said Revari. "I'll want to see that. Should it be...buried?" "That's between you and your religion," said Kaya. "I'm not that kind of exorcist." What Kaya did was seen as blasphemous by some, a disruption of the natural order of life beyond death. But in other belief systems it was the ghosts themselves who were disrupting the natural order, and Kaya who was setting things right. She'd been showered with blessings some places and run out of town in others, all for doing the same thing. Whatever the ultimate destiny of the dead on any given world, it was Kaya's personal conviction that they weren't fulfilling it by hanging around being a nuisance to the living. Revari nodded with satisfaction. His own deeply held religious beliefs, she suspected, called for not paying for another funeral unless he had to. They arrived at the manor. 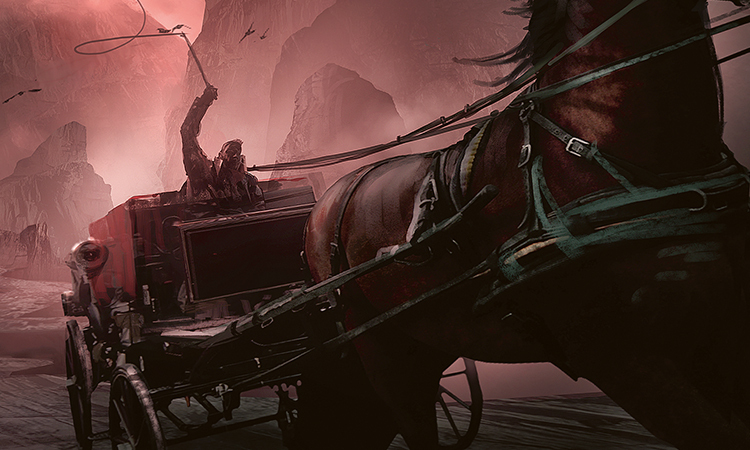 The bodyguard, the driver, and Kaya's payment remained with the carriage, and Revari followed Kaya to the door. He'd brought a lantern, so Kaya didn't bother with wisps. The scene in the entryway was the same as before. Revari murmured in distress as he surveyed the debris. "It'll take a month just to clean up this mess so remodeling can resume," he said. "And that's assuming I can get the workers back in the door." "Would you be willing to, ah, attest to your handiwork? Tell them it's safe to return?" 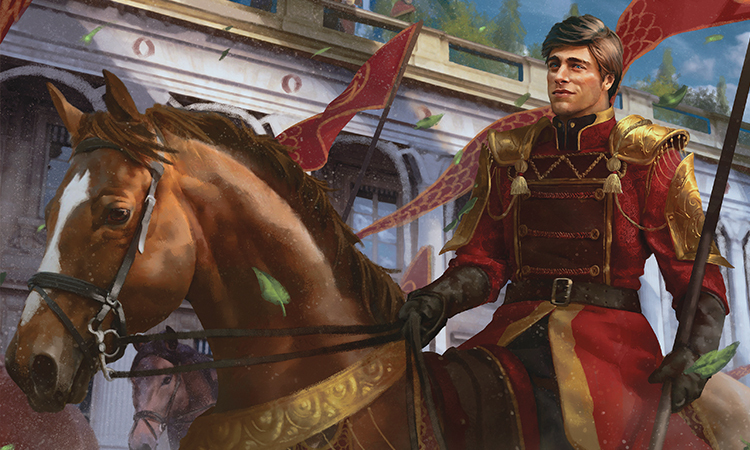 "I could be persuaded," said Kaya, which only set Revari to murmuring again. They ascended the staircase, Revari swinging the lantern around like a nervous young hunter on his first night in the woods. He paused at the top of the stairs. 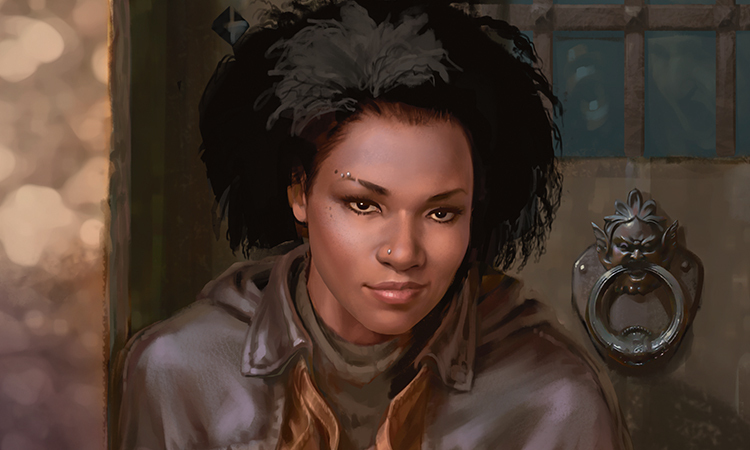 "You'll want to examine the east wing, I'm sure," said Kaya. "Your tip-off was very helpful. That's where I found her." "Yes," said Revari. "Yes, of course. And you're...certain it's safe?" "Safe as your own house, your grace." He nodded and crept into the east wing, lantern bobbing. He jumped at every gust of wind and creak of the floorboards. Kaya walked beside him. "Here we are," said Kaya, gesturing to the closed door of the room where she'd found the old woman's body. "This is where it happened," said Kaya. "You go in first," he said. Kaya smiled reassuringly, opened the door, and stepped through. Revari peered through the door, then stepped through slowly. He held the lantern high, the shadows of the room's ruined furniture looming crazily. Very quietly, Kaya closed the door behind him. "Now then," he said, dry-throated, looking around. "Where is this—"
He stared into the corner where Kaya had pried up the floorboards, then spun to face her. "What is this?" he spat. "What is this?" "I know what you did," said Kaya. Her voice was quiet, measured, calm. Revari's face was red, his veins bulging. "Whatever it is you're trying to extort from me—"
"I don't want anything from you, kinslayer," said Kaya. She nodded, over his shoulder. "She's the one you ought to be worried about." Dear Mother had appeared, sorrowful and timeless, behind her wayward son. Revari turned. Kaya covered her ears. "No," he said. "No. Please, Mother—"
The ghost screamed, and Revari fell to his knees, clutching his head. The lantern clattered to the ground. Kaya picked it up and blew it out, so the room was lit only by the cold light of the dead. Revari turned to her, still on his knees, eyes wide. "Help me," he said. "I'll pay you—I'll pay double!" "Your own mother," said Kaya. "You can rot in hell." His mother's ghost advanced on him slowly, with a flair for the theatric that Kaya could appreciate. Revari edged away on his elbows until he bumped into the closed door. "You liar," he said. "I paid you to, to, to fix this! Stop her! Do your job!" "I'm defaulting, with cause," said Kaya. She hadn't lied to him, not quite, but she hadn't actually done the job either. "I'll tell your underlings they can keep the other half." He snarled and lunged at her, but her legs went ghostly, and he went straight through them and sprawled out behind her with a strangled cry. Then his mother's wailing ghost was upon him with those needle teeth and those dagger claws. Kaya walked through the closed door in a flash of purple-white light, leaving mother and son to their sad, sorry business. Kaya smoothed her jacket, turned, and walked away. Behind her, Emilio Revari began to scream, and kept screaming as she walked down the stairs, across the ruined entryway, through the thick, wooden doors of the manor, and into the night beyond.